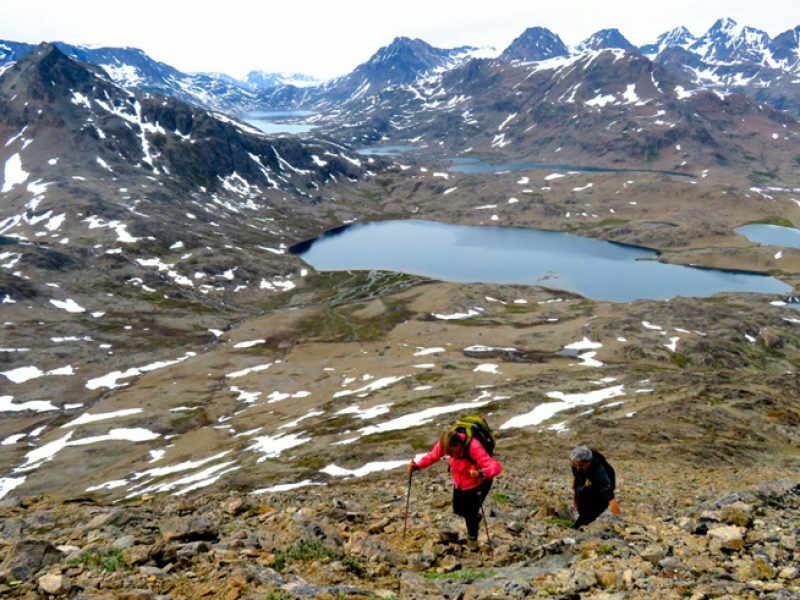 A walking holiday in Greenland will get you well and truly off the beaten track. 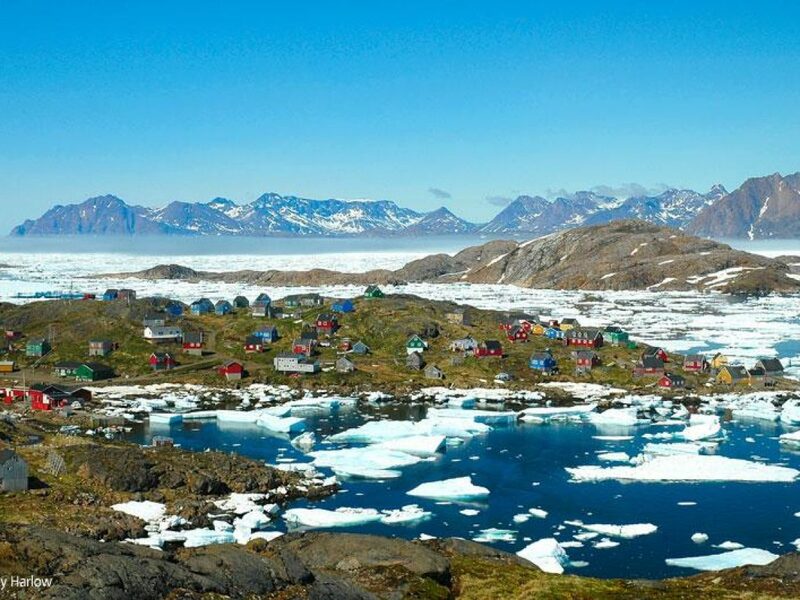 To give you a taste for adventure we asked our expert guide Cathy Harlow to keep a trip diary last summer while leading our Hiking in East Greenland holiday. Travelling to a remote place like Greenland is often dependent on the weather; even so, ‘Air Iceland announce the cancellation of today’s flight to Kulusuk’ was not what we hoped to hear after a long wait at Reykjavik Airport. Fog at Kulusuk meant planes could neither land nor take off. So it was another night in Reykjavik for us. We made the best of it with a hike up a suburban salmon river to a small waterfall – hoping for better conditions the next day. News was in that the flight was going ahead. Back at the airport, we boarded the 40 seater twin prop plane and in less than two hours, icebergs loomed out of the mist as we bounced down onto Kulusuk’s gravel airstrip. After checking into the island’s only hotel, we set off for a coastal hike among huge blocks of pack ice stranded on the shore at low tide. Stoically, we turned a blind eye to the weather, focusing instead on the wonderful shapes and colours in the ice. Later, we walked into the village and found sanctuary in the beautiful timber church, built in 1908 from the wreckage of a Danish ship trapped in the pack ice. Back at the hotel, we grabbed dinner and then hopped onto the hotel’s boat for a cruise among icebergs to the snout of the Apusiaajiik Glacier, again a bracing but exhilarating experience. It’s just a short hop by helicopter from Kulusuk to Tasiilaq formerly Ammassalik. These are two of the many hundreds of barren, rocky islands guarding an impenetrable maze of fjords and inlets on Greenland’s sparsely inhabited east coast. Checking into the hotel, we were happy to note that the rain had let up at last, and the clouds were dispersing. We started the day’s walk along a gentle path through the Valley of Flowers. 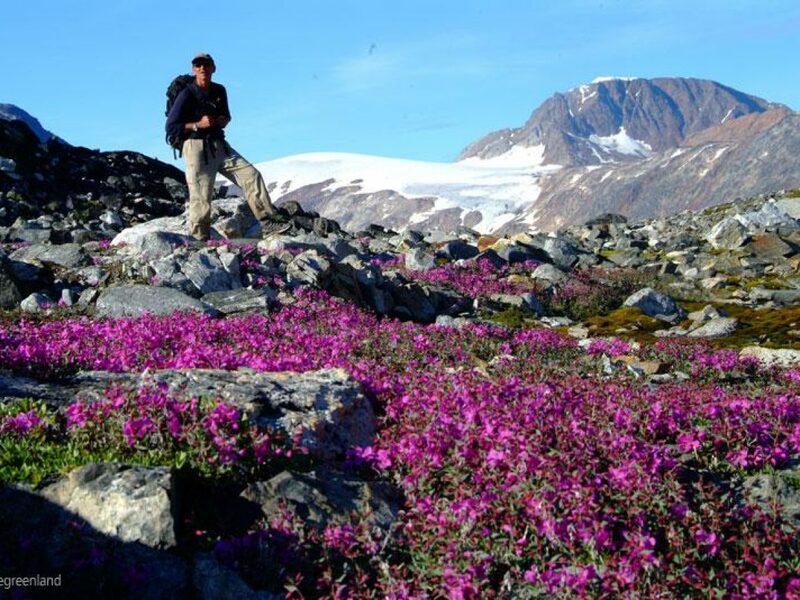 Many delicate Arctic plants were in bloom: Alpine Catchfly, Moss Heath, Trailing Azalea, Glacier Buttercup, Moss Campion, Roseroot and Arctic River Beauty. We forded the river above a small waterfall and tucked into a packed lunch from a viewpoint over a small lake. Afterwards we traced the lakeshore, fording a second stream and then climbed to a saddle. From here we followed a ridge extending wonderful views towards the open sea and the giant icebergs grounded at the narrow entrance to the bay. Back in town, we stopped at the very interesting and well-stocked ethnographic museum, where the curator took time to answer the many questions we put to him about life in this remote place. Over dinner, our gaze fell on the ice-filled bay and the many icebergs mirrored in its glassy surface. Today dawned clear but cloudy. From Tasiilaq town we hiked along the coast on an easy trail hovering above chaotic icebergs scattered randomly on the surface of the calm fjord. Following the track upstream past a series of rapids, we waded across the stream where it exited the first of five lakes; the chilly water tingling our toes. A sea mist played hide and seek with the pink pyramidal peaks above, just allowing us a glimpse of Mittivakkat glacier. Arriving at Lake 168, we picnicked among huge gneiss boulders and clumps of saxifrage and hairy lousewort – not a great name but a beautiful pink flower nevertheless! And finally the sun appeared for an hour or so to lighten the hike back to town. On our return to the hotel, we met Chai, who was to join our group for the last few days, while tomorrow we would say goodbye to Karen, who’d started out with us but had opted for the shorter itinerary. Finally a blue sky! We hopped on a boat for a quick spin across the bay to Aammaqqaaq, a finger-like peninsula. We loaded into a tiny zodiac for the shore landing on the rocky coast. You’re alone in the world here, the silence cut only by the faint howl of huskies and the distant throb of the helicopter. We stepped gingerly on the soft moss and multi-coloured lichen, skipping over granite slabs to gaze at the multi-coloured icebergs, stranded on the beach like giant fungi and angry sea monsters. We stumbled on the remains of an Inuit summer camp – it’s amazing to think that the people of East Greenland only became known to the outside world just over 100 years ago. All around, the jagged peaks framing the bay are a reminder of just how inhospitable these barren rocky islands are and we marvelled at the peoples’ skills to survive there. We climbed to a ridge for the view, then made our way around the coast back towards base. We stopped to admire the hundreds of huskies tethered outside their kennels and spoke at length to one of the locals who’d come to check up on his litter of husky pups. Cute or what!! Amazing weather again today! We grabbed the chance to take a morning boat trip to Ikkattek, a tiny island at the entrance to the 100km long Sermilik Fjord. Here we witnessed giant icebergs calved from the inland icecap jostling for space among the broad slabs of pack ice. The settlement has largely been abandoned as families move way to an easier life in the larger towns, yet leaving most of their possessions behind. In the schoolhouse, we found books, posters and papers all in place – it seemed that the teacher and pupils would walk back in at any second. By the shore, Mike picked up some sparkling garnets, embedded in pebbles – always good having a geologist in the group! In the afternoon, we zig-zagged up the Seaman’s Mountain, a 608m summit behind the hotel, which offers a panoramic view over much of the terrain we’d covered on foot over the last few days. The visibility was perfect, allowing us to look down over many of the areas we’d walked through during the last few days, a fitting end to our exploration of Ammassalik Island. I think we did in just over 3 hours (record time!) getting down in time for another fine dinner, chased down with a cold beer at the Hotel Angmagssalik. Our early helicopter transfer back to Kulusuk was in almost perfect weather and the views were outstanding as we flew over the craggy summits and iceberg-studded sea. Arriving at Kulusuk, we checked into the hotel and set off on foot for our last hiking day. What a change from the start of our trip when we’d braved a howling wind and lashing rain. The sun was out and the thermometer looked set to top 15 degrees Celsius. We followed the dirt road, snaking up towards the masts of the US built radar station. After admiring some polygons, we hauled up the steepest part to a viewpoint over the open sea. Here, over a picnic lunch, we admired the extent of the pack ice and the many huge icebergs trapped in it. On the way back down, we stopped to look at the Reindeer Wall. There’s no sign that reindeer have ever been found on Kulusuk, yet the structure appears to have been built by hunters to herd the reindeer through a narrow gap, where they can be easily killed. Archaeologist Terry scanned the ground for clues. Taking advantage of the fine weather, we returned along the ridge and took a quick look at the village of Kulusuk, which looked much more welcoming in the sunshine. Our flight from Kulusuk to Reykjavik left on time, after an anxious moment when threads of mist drifted in from the sea. Back in Reykjavik, it was time to say goodbye as we made our way to our accommodation. 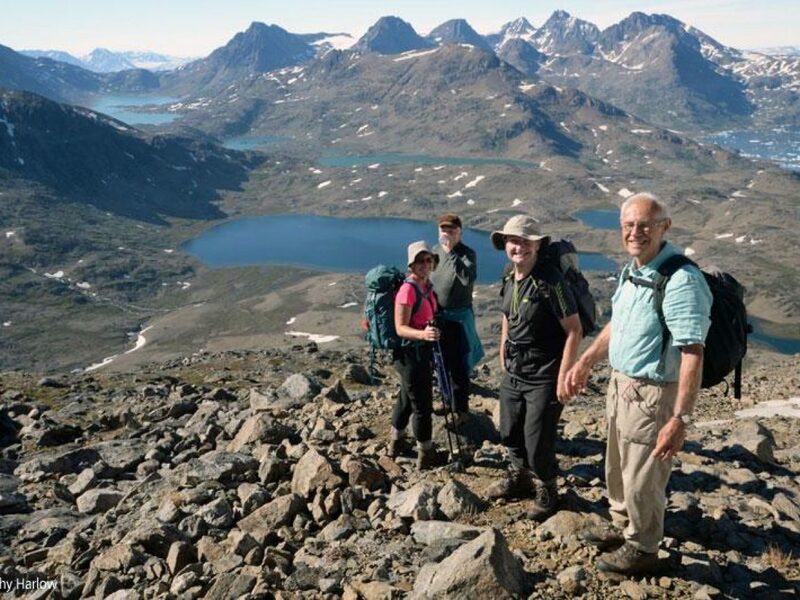 Find out more about Hiking in East Greenland guided by Cathy Harlow, with the choice of 6- and 9-night options or to discuss your plans further, contact our team of Greenland Travel Specialists to find out more or to request a tailor made quote. 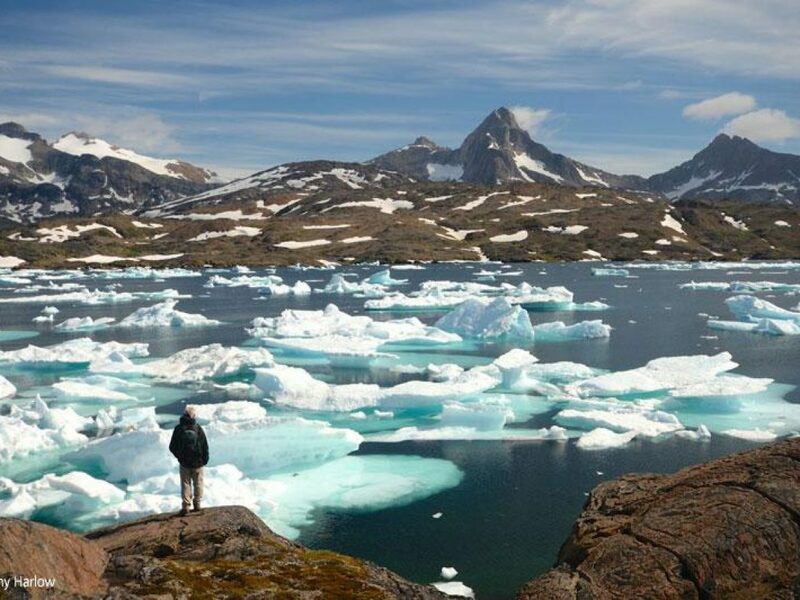 Nordic Travel Specialist, Greg, shares a collection of stunning images taken on his hiking trip in East Greenland. What’s New in Iceland & Greenland for 2018? Cathy has worked with us as a guide for over 30 years – leading our Orcas & Auroras and Hiking East Greenland holidays.